*This post has been sponsored by Clorox. All thoughts and opinions are my own. How often should you clean THAT? I’ll show you how to clean your house faster and keep it clean. 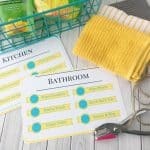 Use this free printable cleaning routine to see how often you should be cleaning various things around your home. By doing these on a regular schedule, your house will be clean and it won’t be such a big chore. If there is one thing I really don’t have time for, it’s cleaning my house! 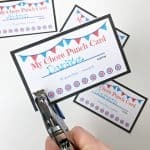 Between taking care of four kids, running my own business and getting dinner on the table every night, staying on top of the housework can be a challenge. That is why I created a system to keep the house clean, in less time, by following a routine to stay on top of the chores. When things are cleaned more often, there is less need for deep cleaning and it saves you a lot of time. I always relate it to hotel rooms. They are cleaned every day. This cuts down on the amount of deep cleaning that needs to be done, and they can turn an entire hotel over in a matter of hours because everything is wiped down or cleaned daily so there is less work overall. Adopt this same strategy with my printable cleaning routine and your house will be clean more often and will be easier and faster to clean. Having a routine or a system is essential to speed up any process. It’s no different for chores and keeping your house clean. 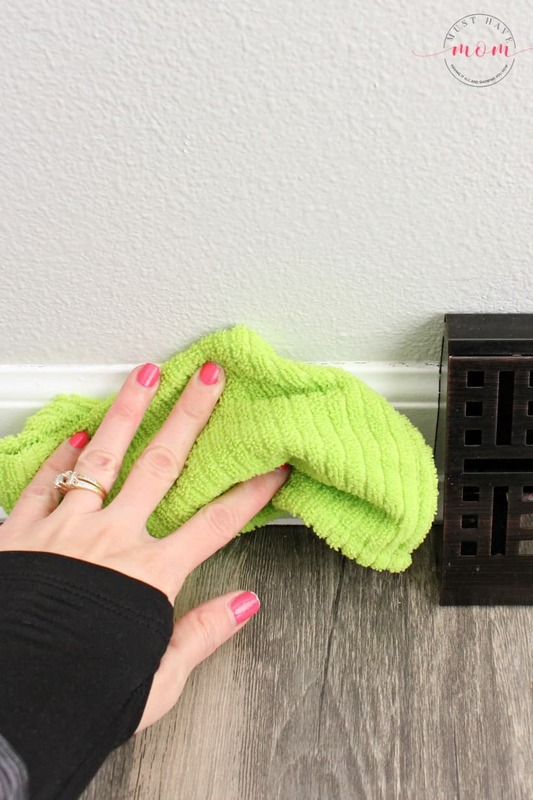 I’ll show you how I use this routine to keep my house clean and how to clean your house faster with my simple cleaning hacks. Wipe down countertops: I keep a canister of Clorox Disinfecting Wipes under every bathroom sink so I can quickly wipe down the countertops. By doing this daily, it’s a quick and easy task. In the kitchen I keep a bottle of Clorox Clean-p Disinfecting Spray and a roll of paper towels under the sink so I can easily wipe down the countertops daily, along with any extra times (like when I prep chicken, etc). Find them in the cleaning aisle at Walmart. Wipe out kitchen sink: Our sink is porcelain and tends to stain really easily. I use the Clorox Clean-Up Disinfecting Spray to wipe it out daily and when it gets stained I will fill each sink halfway with water and add Clorox Bleach to it and let it soak for awhile. This removes the stains without any scrubbing. Wipe off table: We typically wipe the table after each meal because my kids are messy! Once a day though I use Clorox Clean-Up Disinfecting Spray so I know all the germs that could be lingering on the table are cleaned away properly. Empty trash: Empty any garbages that are full (kitchen, bathrooms). Sweep floors: It’s amazing how much ends up on the floor. By quickly sweeping it each day you’ll always have a clean floor. Declutter paper: My kids bring home so much paperwork from school. Add the daily junk mail and bills to the pile and it quickly turns into clutter. Keep it under control with organized places for all the paperwork and don’t let it pile up on the counters. Make beds: There is something to be said about making the bed each day. It helps to keep the house looking tidy and I am generally more productive when my house is tidy and the beds are made. Wash/Dry/Fold load of laundry: I wash one load of laundry a day and this helps keep it from piling up. The key here is to also fold it and put it away or you’ll end up with a mountain of clean clothes that need to be folded and put away. 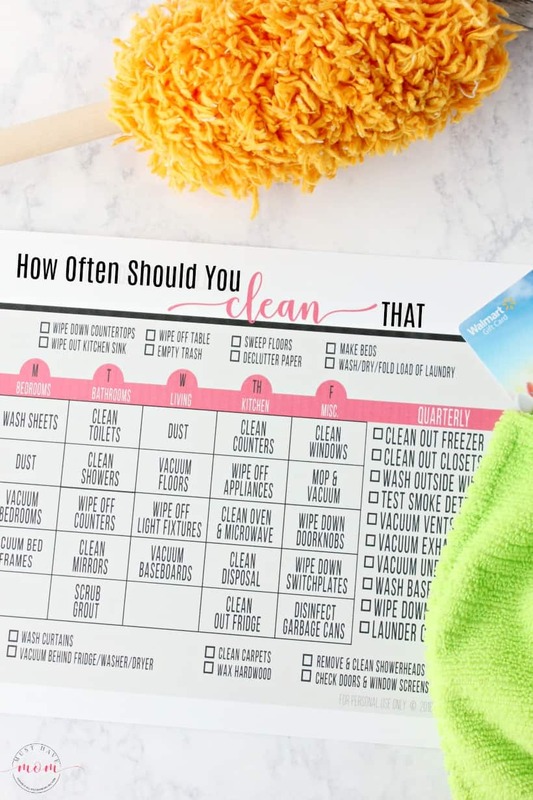 Use the free printable cleaning routine to follow along with these weekly tasks. Clean Toilets *Use my hack below to reduce how often you have to do this! Clean Showers *tip: I use Clorox Clean-Up Disinfecting Spray in my shower and just spray it on, let it sit and then use a spray nozzle that hooks up to the showerhead to rinse it off. No scrubbing required! Wipe off Counters – I do this daily but once a week I will move the canisters and other things on the counters and wipe under/behind them. Clean Counters – Once again, this is the day I move everything off the counters and properly clean them. I do the kitchen counters on Tuesday and the bathroom counters on Thursday. 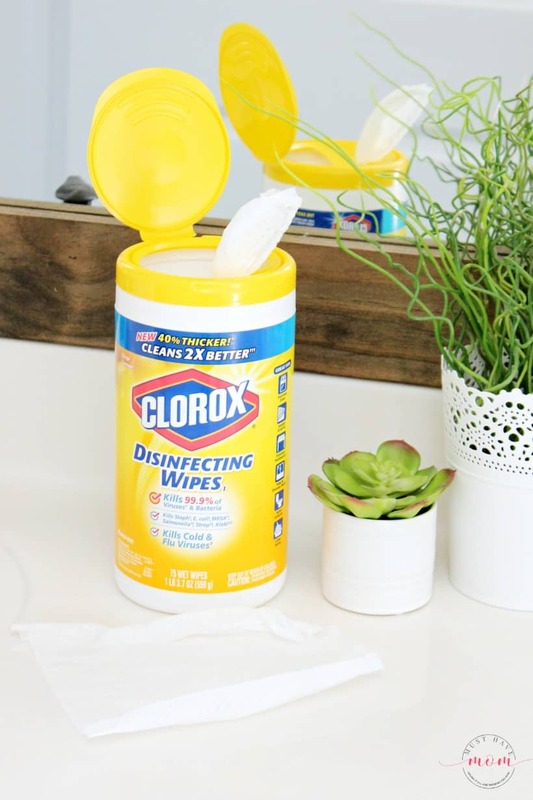 Wipe Down Doorknobs and Switchplates *I use Clorox Disinfecting Wipes to wipe down all the doorknobs and light switches since these are items that are used often and can spread germs. Clorox kills the germs and disinfects the surface which can help keep your family healthy. Disinfect Garbage Cans *I spray Clorox Clean-Up Disinfecting Spray in mine and wipe it out with paper towels. If they are really gross, put them in the bathtub and use Clorox Bleach to soak them and then spray/rinse them out. 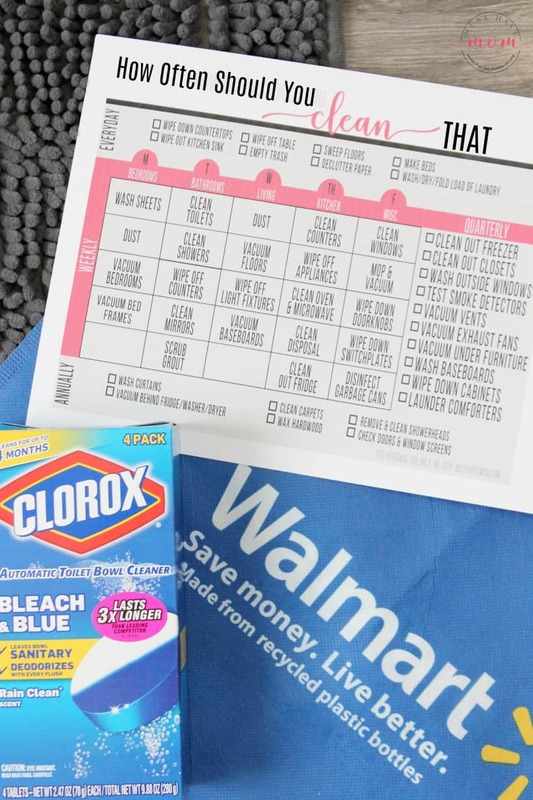 Then line them with Glad Clorox Tall Kitchen Bags with Clorox which you can find in the trash bag aisle at Walmart. I found our toilets get dirty really fast thanks to our well water sediment. 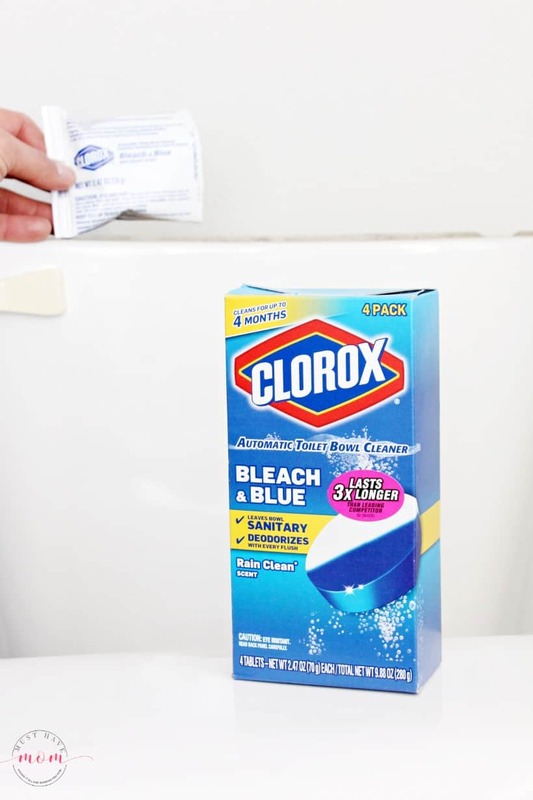 We started putting Clorox Automatic Toilet Bowl Cleaner tablets in our toilet tanks and it now keeps our toilets clean for up to four months. It has saved me time and kept our toilets looking great which is especially helpful when we have surprise guests show up! Clean out freezer – toss freezer-burned food and dig out any old food that is buried so it is on top and can be used first. 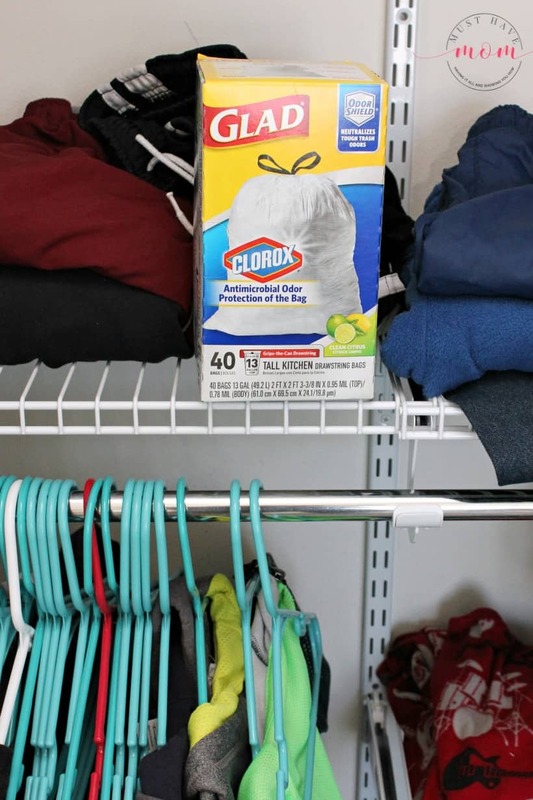 Clean out closets – I use Glad Kitchen Trash Bags with Clorox to sort clothes into “donate”, “sell” and “hand-down” piles. Take out any items that are too small or that they don’t wear. The less clothes in the closet, the easier it is to keep organized. Test smoke detectors – It’s a great idea to do this every daylight savings time. 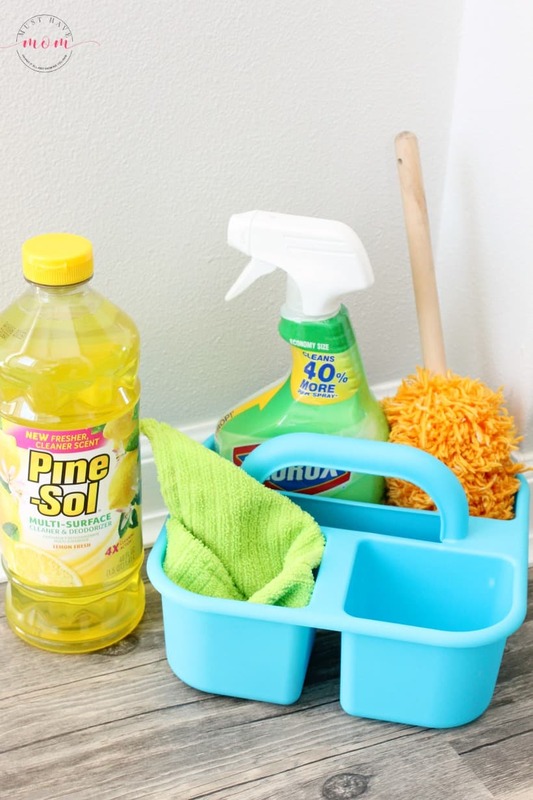 One cleaning hack that I found to be super helpful is to create a cleaning caddy with all of your cleaning essentials in it so you can go room to room without having to go back and forth for cleaning supplies. 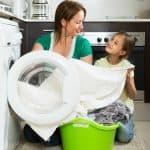 Do these cleaning tasks once a year to keep everything clean and reduce how much deep cleaning you need to do. 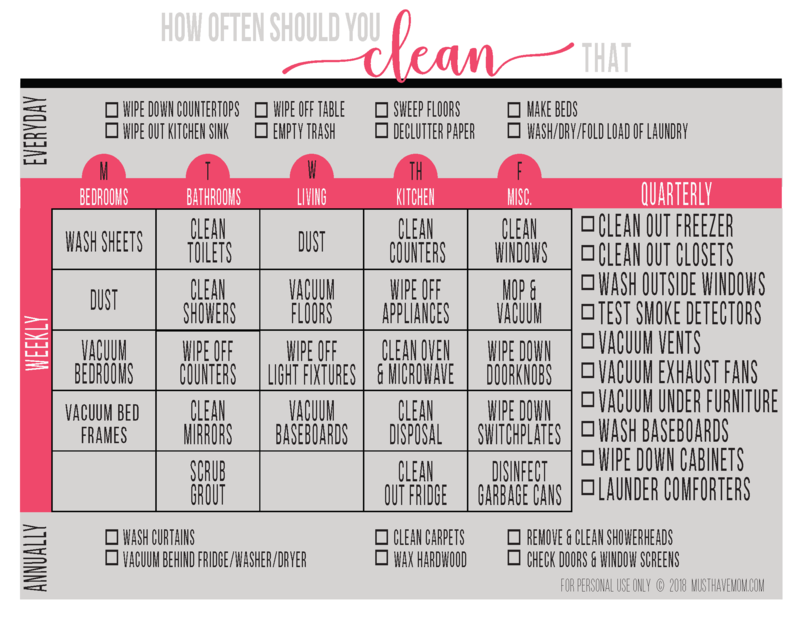 Print this handy free cleaning routine sheet to keep track of your cleaning tasks and ultimately, keep your house cleaner and reduce the amount of time you spend cleaning and deep cleaning. Take all of these tips and the free cleaning printable and put them into action and you’ll quickly learn how to clean your house faster! You’ll find your house stays clean and you spend less time doing it. You can buy all of the products I recommended in this post at Walmart in the cleaning products aisle. Get more fun Spring cleaning ideas on Walmart’s site! I could definitely use a routine like this. Usually by the Weeknd our house is a disaster because nobody has done any cleaning whatsoever. I think I might make a list like this so that I keep up with it. It’s always hard for me to get organized when cleaning! Having a list makes it much easier to remember what needs to be done each day. You would think I have been cleaning my house long enough to have it down to a science, but I don’t! Thanks for these great tips. I think I’ll print your list, too! Yes! I feel like the wipes are my secret weapon haha. This is a great cleaning checklist! I’m the world’s worst housekeeper. While I try to remember to do a load of laundry every day, most days, my laundry ends up sitting in the washer until I think about doing laundry again the next day! I’m going to try hanging your list on my fridge as a reminder. Thanks for all the great tips! I printed out the schedule. I don’t have a routine and I am hoping your ideas help change that. What a great post. I need to print this out. Cleaning takes up a lot of my time right now. This is absolutely the way I clean my house, with the exception that I always get diverted. I’m going to use to follow your steps and not be diverted and see if I can get it done faster. Thanks! Let me know how this method works for you! I find I get easily diverted as well and this helps me stay on track! I have a cleaning schedule like this and clean my house in zones Monday – Thursday. I like having only a small amount to clean daily and having Fridays ”off”. It either gives me a free day or a “make up day” if I end up missing a day during the week for some reason. When my family all lived at home I washed laundry on Monday’s and Fridays (clean for the week and the weekend), beds on Fridays because with sports on the weekends everyone seemed to shower more frequently then. On Mondays I washed towels because they had been used so much over the weekend. These are all great tips. Thanks for sharing your routine with us! What a great cleaning checklist. I think I have to follow your mentioned cleaning steps.